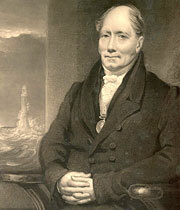 From 1811 onwards, Stevenson pursued a number of other projects besides lighthouses and maritime work. There were several canal schemes (though none were executed, mainly on grounds of expense), and rail, road and bridge projects. The rail and road projects often involved him in a promotional role as well doing the engineering. In 1817, Stevenson proposed a canal on one level between Edinburgh and Glasgow — including a tunnel nearly 5km long beneath the Bathgate Hills — with a connection to Leith that had locks. The estimated total cost was �1,999. He also proposed a canal in the Vale of Strathmore, almost 26km long, between Forfar and Arbroath, estimated at �,378. He worked with engineers Thomas Telford (1757-1834) and Alexander Nimmo (1783-1832) on a proposal for a new harbour at Wallasey, connected by an 11km ship canal across the Wirral Peninsula to the Hilbre Islands off West Kirby. This would have linked the Rivers Mersey and Dee. Their joint report was submitted in May 1828, with a construction estimate of �4m (unexecuted). In all his canal schemes, Stevenson endeavoured to keep levels constant and locks to a minimum. He applied a similar 'keep it close to level' design philosophy for rail tracks — even if it meant detours or additional viaducts. By about 1818 he had decided that railways were superior to small canals for inland communication. At this time it was all horse-drawn railways, as locomotive engines didn't come into general railway use until after 1825, despite Richard Trevithick's (1771-1833) pioneering work on steam locomotion in 1801-08. In 1818, Stevenson advocated the use of 3.7m - 6.1m long, malleable iron-edge rails in preference to the much shorter (typically 900mm long and weaker) cast iron rails then prevalent. Rail pioneer George Stephenson (1781-1848), acknowledging Stevenson's influence on John Birkinshaw's development of malleable wrought iron rails — forerunner of modern steel rails — wrote to Stevenson on 28th June 1821, "I know you have been at more trouble than any man I know of in searching into the utility of railways". Later that year, he proposed the construction of Edinburgh Railway, to connect the city and its port of Leith with the Midlothian coalfields, in a report addressed to Walter Montagu Douglas Scott, Duke of Buccleuch and Queensberry (1806-84), among others. This work helped the successful completion of the Edinburgh & Dalkeith Railway in 1831 for a group of subscribers led by the Duke. In 1819, Stevenson proposed a railway in Angus between Montrose and Brechin. Also in 1819, Stevenson advised on the line for the Stockton & Darlington Railway, which was intended to be a horse-drawn plateway. However, it later became the first permanent public railway to be powered by steam, and was constructed under George Stephenson's supervision in 1822-25. By 1820, Stevenson was the leading authority on horse-traction railways in Scotland. He edited and produced accompanying notes for the numerous Essays on Rail-Roads submitted to the Highland Society in response to a competition they initiated in 1818, with a premium of 50 guineas (�.50) for the best essay on railway construction. His Notes were published in 1824. By 1836 he had planned enough railway schemes to traverse Scotland east from the Tweed Valley to Perth and Aberdeen, and west from Edinburgh to Glasgow via Bathgate. His schemes were close to the routes of the eventual rail network but the financial climate at the time was unfavourable and the necessary finance for their implementation was not forthcoming. The only scheme constructed was the short Newton Colliery Railway to Little France near Edinburgh, part of his original Edinburgh Railway proposals. However, Stevenson was more successful with road making and with the promotion of stone tracks in city roads. Granton Road (now in Edinburgh) was built as part of his 1834 proposals for Granton Harbour and its road and rail infrastructure. He was a notable highway planner and bridge engineer — proposing, designing and constructing many different types of bridges throughout Scotland. Stevenson's masonry bridges are characterised by segmental arches. Fine examples still exist — Marykirk Bridge (1811-14), Annan Bridge (1824-27), Stirling Bridge (1829-32) and Allanton Bridge (1840-42). In 1816-17 he took charge of widening Lugton Bridge (c.1765), and later he also planned the town approach for his William IV or 'New' Bridge in Stirling. He was instrumental in the improvement between 1815 and 1819 of his home city of Edinburgh. He designed the London Road approach and Regent Road approach to the east end of Princes Street, skirting Calton Hill and including the single span Regent Arch with its open parapets. He was also responsible for the construction of the roads, which involved blasting, rock excavation and a massive retaining wall. In Glasgow, Stevenson built two bridges over the River Clyde. The first was Hutcheson Bridge (1831-34), a five span masonry structure that was described by Stephen Fenwick, of the Royal Military Academy, in his 1861 book The Mechanics of Construction as "one of the best specimens of the segmental arch". It was demolished in 1868 after its piers were undermined by navigational deepening of the river, despite evidence, provided by Stevenson's son David among others, that it could have been repaired. It was replaced by the wrought iron Albert Bridge (1871-72). The second was a 9.75m wide 14-span temporary timber bridge (1832) over the Clyde at South Portland Street. It accommodated traffic while Telford's Glasgow Bridge was being constructed (1833-35) at Broomielaw. It was retained as a pedestrian bridge until 1846 and then replaced by the present suspension bridge (1851-53). He also designed metal bridges, such as the three span wrought iron Abbey St Bathans footbridge (c.1833). This was closed in 1925 and replaced by a cable stayed timber bridge (c.1983) erected by the army. He adopted cast iron segmental arch solutions in major proposals for additions to existing stone bridges, designed to increase traffic capacity. These included Robert Mylne's (1733-1811) bridge at Newcastle upon Tyne (1774-81, demolished c.1876) in 1826, John Smeaton's Perth Bridge (1766-71) in 1827, and Edinburgh's North Bridge (1765-72, designed by Mylne's brother William) in 1832. None of them were executed. Stevenson designed other kinds of bridges too. He developed an innovative (unexecuted) laminated timber arch for Dornoch Firth in 1830, and a new type of medium-span wrought iron suspension bridge without towers. He proposed the latter for numerous locations. Its novelty was that the roadway superstructure rested on the catenarian chains rather than being suspended from them. This, and other Scottish bridge developments, were reviewed in his authoritative article Description of bridges of suspension, published in the Edinburgh Philosophical Journal in October 1821 and translated subsequently into French, German and Polish. He first proposed the new type of suspension bridge — called underspanned suspension — for crossing the River Almond at Crammond, north west of Edinburgh, in 1820. It wasn't built but the concept led to the development of the truss principle, and by 1850 numerous small-span bridges were constructed to this basic plan in Britain and on the continent. Several underspanned suspension bridges would be built in Europe and India by 1870. Though not implemented as intended, Stevenson's proposals together with details of his Glasgow and Stirling bridges, were disseminated widely through John Weale's (1791-1862) The Theory, Practice, and Architecture of Bridges of Stone, Iron, Timber, and Wire (1839). His ideas undoubtedly influenced subsequent bridge-building practice nationally. Stevenson also found time to advise on diverse other structures, notably Arbroath Abbey (founded 1178), Montrose Church (rebuilt 1791-93) and the Melville Monument (1821). In 1809, he rebuilt Arbroath Abbey's circular window in the south transept gable, which had become a useful landmark for shipping. In 1811, he found the bell tower of Montrose Church (now Old and St Andrew's Church) cracked and unsafe, though no action was taken until it was demolished in 1831 and replaced by the present steeple in 1834. In 1821, he was consulted over the foundation design for the Melville Monument in St Andrew Square, Edinburgh, and supervised its erection — using the type of balance crane he had used on Bell Rock Lighthouse.